It’s always great to see young people step out to change the world. We are building our Student Space Ambassador (SSA) program to support young people who want to change the world, while also spreading their love of space and human space exploration within their own communities. We are very excited to introduce one of our Student Space Ambassadors (SSA), Taylor Richardson (age 12). Taylor is a great example of what can be done as a TMG SSA. consisted of eating 3 meals of boiled potatoes with a bit of pepper and drinking lots of water. 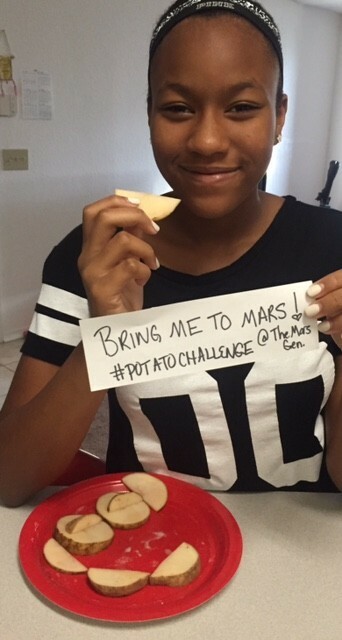 But more than that she worked before and after school with her mom to reach out via social media and email to help raise awareness and funds for The Mars Generation’s campaign. In addition to her work with TMG, Taylor is actively involved in promoting and supporting several causes, including childhood literacy, the Unity Day anti-bullying campaign, a girls’ empowerment club, and clothing drives for women and children. Taylor organized Take Flight with A Book, a program that works in conjunction with the United Way Reading Pals program. By February 2015, she had collected nearly 200 books and donated them to North Shore Elementary School, located in Jacksonville, Florida. 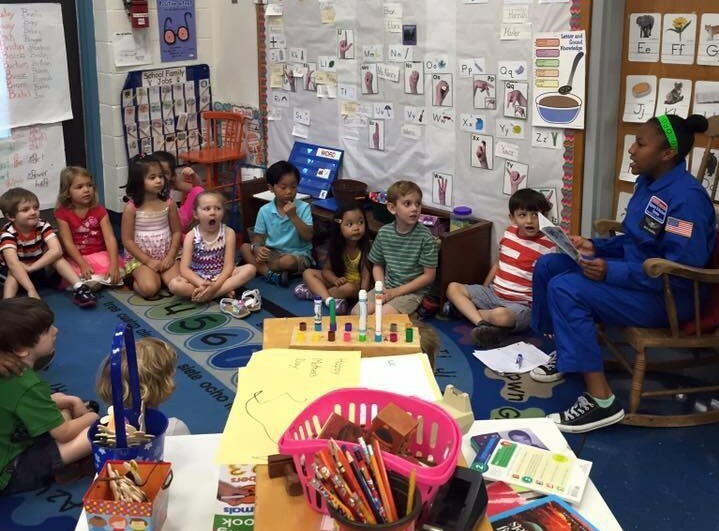 She also visited North Shore to read to the Pre-K class, while wearing her astronaut suit. 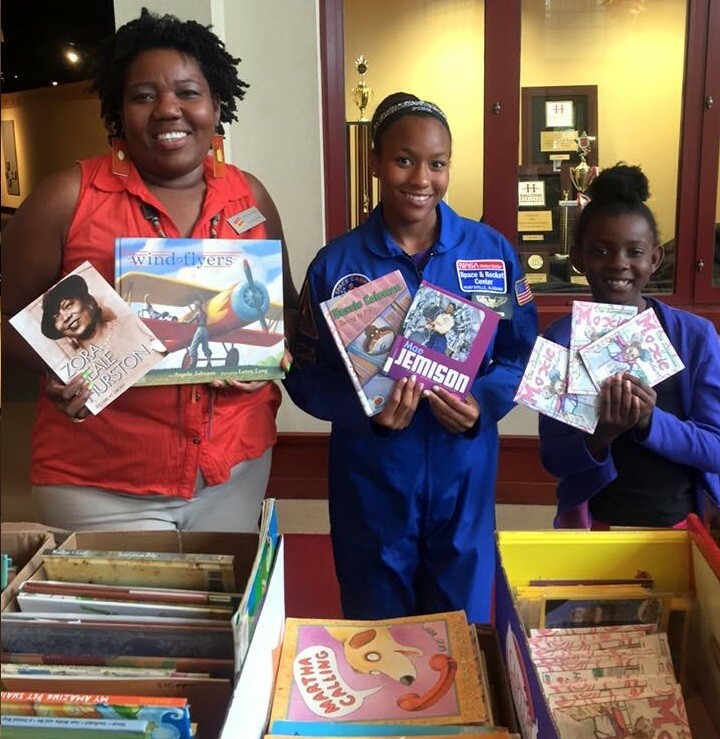 In November 2015, ‘Take Flight’ partnered with the Ritz Theatre & Museum to be one of multiple drop-off sites for books. With this, Taylor hosted a children’s book reading while dressed as Astronaut Starbright to promote the Black Wings: American Dreams of Flight exhibit on loan from the Smithsonian Institute. Taylor collected over 500 book donations during the event. As a TMG Student Space Ambassador, Taylor is inspiring others to dream big, act big, and go out to make a change in the world. By sharing her excitement and passion for space with others, she truly embodies the spirit of The Mars Generation and we couldn’t be prouder. Thank you Taylor for being a great earthling, a budding “Martian” and an inspiration to many! We are thrilled to be a part of your journey!